Got some eggshells saved? WTOP Garden editor Mike McGrath has a few ideas on how you can use them to help your tomatoes and cucumbers. Catch me on Saturday, Feb. 23 and Sunday, Feb. 24 at the Capital Home & Remodel Show at the Dulles Expo Canter in Chantilly, Virginia. Yes, Eric. The calcium in those shells is the missing nutrient in many of our soils, and it would be hard to overdo its use in this form, as eggshells release this essential nutrient ever-so slowly. Place the shells of a dozen crushed eggs into the planting hole of each tomato and you’ll never see blossom end rot again. Do the same with cucumbers, and the fruits will be much crisper, even when made into pickles. Before we explore Eric’s other options, let’s first explain why the No. 1 use for eggshells is in the planting hole of tomatoes. Tomatoes are prone to a condition (technically known as “a cultural problem,” like opera and reality TV) known as blossom end rot, when the fruits turn black on the bottom and fall apart just as they begin to ripen up. The direct cause of blossom end rot is uneven watering, but adequate soil calcium can prevent the problem. And the best way to apply that calcium is in the form of a dozen finely crushed eggshells dusted right over the top of the baby plant’s root ball before you fill in the hole. The basic answer is no, Eric. Calcium has value to most, if not all plants. The biggest benefit after tomatoes is to cucumbers. Place the crushed shells of a dozen eggs right down in their planting holes to provide easy-to-reach calcium, and your cukes will be noticeably crisper — and that crispness will extend to any cukes that you put up into pickles. That’s why calcium is always listed as an ingredient on commercially-jarred pickles. Yes, Eric. 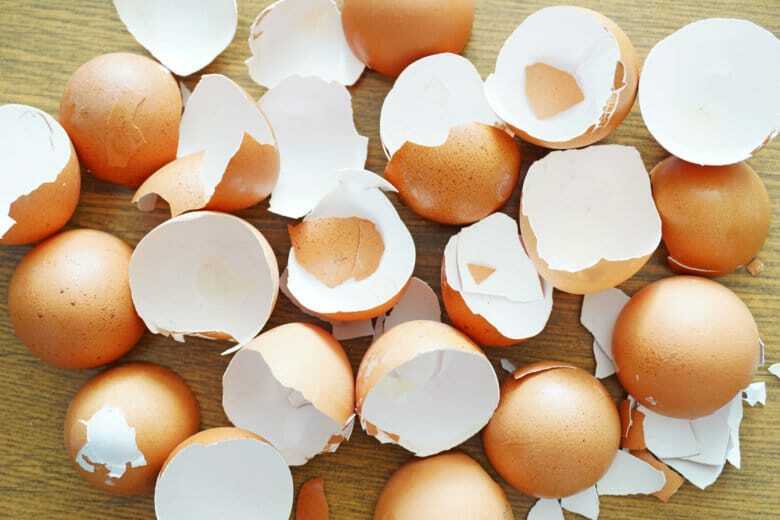 First, you should always drop the dried crushed shells of a dozen eggs into the planting holes of tomatoes (to prevent blossom end rot) and cucumbers (to make them crisper). After that, feel free to drop small amounts into the planting holes of other summertime favorites, such as peppers and eggplant. Then, sprinkle any leftovers on the surface of the soil in damp areas of your garden. Slugs vs. eggshells: The shells win! Eric wants to know how else he can use crushed eggshells in addition to protecting his tomatoes from blossom end rot. Well, Eric, the crushed shells are very useful when used above ground to protect slug-prone plants in damp garden areas (and/or in soaking wet seasons like last year). Just sprinkle a circle of finely crushed eggshells around your lettuce, potatoes, hostas and other favorites; the slugs can’t cross over this protective line. Time for you to get eggcited! So, allayouse out there: Start saving your eggshells now, as May is no longer that far away. Just put the shells back into their egg cartons, leave them out in the open to air-dry for a day or two, and then store them in a cool, dry spot. Note: If you crush them up in advance like Eric, make sure you have one carton of just shells to measure by. Take the shells from that carton and crush them into a clear glass measuring cup. Then, use that cup as your gauge for what a pre-crushed dozen looks like.